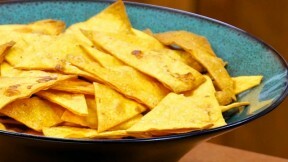 These quick-to bake tortilla chips are so crispy and tasty that you will not miss the oil or the extra calories found in most store-bought varieties. Cut tortillas into “chip”-size portions. Put the cut tortillas, chili powder, and salt in a large bowl. Toss to coat. Arrange the tortillas in a single layer on the prepared sheet. Bake 7 to 10 minutes or just until crisp and edges are slightly browned. Sprinkle with more salt, if desired. For a gluten-free option, use brown rice tortillas instead of whole-grain tortillas. Flavored tortillas, like spinach or chipotle, work well in this recipe.